Gillis van Coninxloo was a late 16th century and early 17th century Flemish painter of forest landscapes. 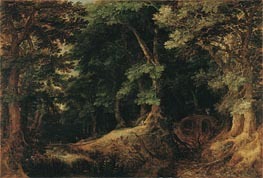 Van Coninxloo is considered the founder of a new approach to the painting of forests; while earlier forest landscapes had used woods as backdrops for human activity, van Coninxloo made them a subject, submerging tiny human figures in elaborate compositions of trees in hugely exaggerated scale. Van Coninxloo was a major influence on several better known Flemish landscape-painters.